2014, 2015 and 2016 Hostelworld Hoscar winner - Most Popular Hostel in Prague! Are we fully booked or you can't find the right room type in this hostel? 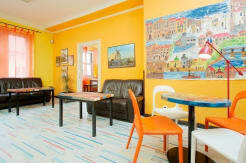 Then try our another top located hostels here on Hostelworld.com, Prague Square Hostel or Hostel Prague Tyn, both just 200 steps from Old Town Square or Hostel Santini Prague located at the Charles Bridge. We’re in Old Town next to Old Town Square and the Astronomical Clock. Why spend money for public transport or taxi?! You can go from a club/bar directly to your bed - no taxi needed! 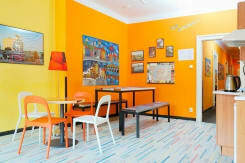 Hostelworld.com customers have made us a top-rated hostel in 2008 and 2009. We’ve also been recommended by Le Guide Michelin - Green Guides, Rick Steve's Guide, Let’s Go and USA Today Travel and we received the Tripadvisor Certificate of Excellence for 2010. We have rooms with two-to-eight beds as well as a suite for up to five guests with a private bath. 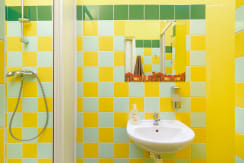 Rooms include free bed linen, towels and soap as well as free lockers in each dormitory. 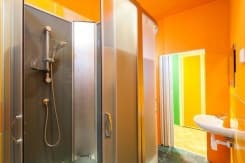 Our showers are hot 24hrs a day. 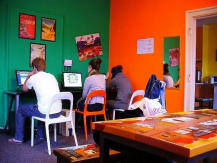 Our hostel offers free internet, free Wi-Fi, free breakfast, free luggage storage and safety deposit boxes, free use of our iron and hair dryer, plus more. 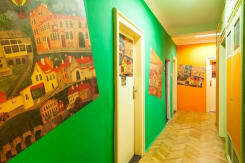 We’ve also got free maps of Prague and free tours! The pub crawl picks up at our hostel every night. We’ve negotiated discounts to some of the must-see places in Prague like the Museum of Communism, Bohemian Bagel, Sandeman’s Prague Tours and more...so just save your money with us! We’re just one minutes’ walk from Kotva department store, two minutes from Old Town Square and five minutes from the Jewish Quarter and Wenceslaus Square. It’s only a minutes’ walk from here to Namesti Republiky, where you can find the tram connection, metro line B, the airport shuttle and Palladium shopping mall. Ten minutes from here is the main railway station (Hlavni nadrazi), Masaryk Station (Masarykovo nadrazi) and bus station Florenc. 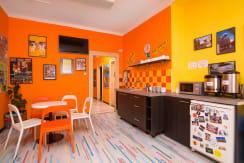 The entire hostel is equipped with a modern fire alarm system with smoke detectors and fire extinguishers on every floor as well as a video monitoring system in the entrance area and each floor’s common areas. Are we fully booked or you can’t find the right room type in this hostel? 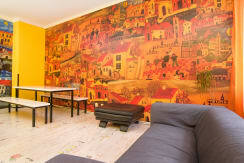 Then try our sister hostel, Prague Square Hostel, another top-located hostel here on Hostelworld. It’s just 200 steps from Old Town Square. When you get off the metro car, take the exit for Namesti Republiky - Palladium. Then it's about a two-minute walk from Namesti Republiky to our hostel. Look for the department store Kotva (which is opposite the Palladium). We're located just behind Kotva. During the day you can take a shortcut through the passage underneath Kotva in order to get to Benediktska St, where our hostel is located. You will see our yellow sign outside. If you can't find the passage underneath Kotva, walk past Kotva department store, down Revolucni St. Then take the first left onto Dlouha St. When on Dlouha street, take the first left onto Benediktska St. Follow the road round and you'll see our yellow sign. Avoid taxis standing in front of the station. If you do take a taxi, it shouldn’t cost more than 250czk. Alternately, take metro line C (red line) to station to Florenc (one stop) and then switch to line B (yellow line) and get off at station Namesti Republiky (one stop). Then see directions from Namesti Republiky as above. 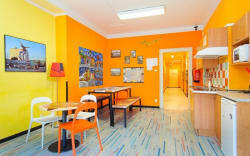 Or take tram 5 or 26 in the direction of Revolucni St.
Or you can walk from Hlavni Nadrazi to our hostel in 15 minutes. Take bus 100 to final stop Zlicin. Change there to metro line B (yellow line) and take the metro to Namesti Republiky station. Alternately, just take a shuttle bus from the airport to Namesti Republiky. Then see directions from Namesti Republiky as above. Take metro line B (yellow line) to Namesti Republiky station. Then see directions from Namesti Republiky as above. Alternately, you can walk from Florenc bus station in 10 minutes. Avoid taxis standing in front of the station. Take metro line C (red line) to Florenc station. Then switch to line B (yellow line) and go to Namesti Republiky station. 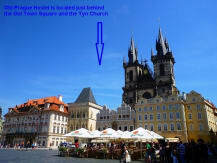 Then see directions from Namesti Republiky as above. Located near laundromats, airport shuttle, department store, cinemas, fast food, tram, subway...and because of our location we're near bars, pubs, clubs and all historical sights.